Anti-Assad forces battling each other as the CIA helps Hezbollah. Yes, Hezbollah. President Obama’s catastrophically bad idea of arming Syria’s rebels is exploding in his face like one of Laurel and Hardy’s cigars. The rebels are battling each other—including beheadings!—amid growing atrocities by the Islamists and pro–Al Qaeda types among them. President Bashar al-Assad is chortling that the toppling of the Muslim Brotherhood in Egypt kicks the pins out from under the Muslim Brotherhood–led factions in Syria. Congress, normally a pushover for anything like a covert operation backed by the White House, is fighting back. And now the CIA has been forced to warn Hezbollah—yes, you read that correctly: the CIA is warning Hezbollah—that pro–Al Qaeda Syrian rebel factions are planning attacks on Shiites, including Hezbollah, in Lebanon. Let’s start with that last piece of shocking news first. The U.S. Central Intelligence Agency warned Lebanese officials last week that al Qaida-linked groups are planning a campaign of bombings that will target Beirut’s Hezbollah-dominated southern suburbs as well as other political targets associated with the group or its allies in Syria, Lebanese officials said Monday. The shooting death this week of a rebel commander in northern Syria—apparently at the hands of an Al Qaeda–linked militant faction—has exposed tension between the disparate forces fighting to oust President Bashar Assad. 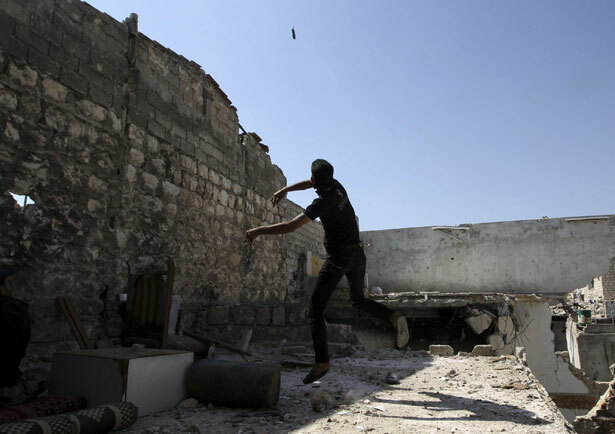 Competing rebel factions in Syria are increasingly attacking each other in a series of killings, kidnappings and beheadings, undermining the already struggling effort to topple President Bashar al-Assad. Last week, members of the Islamic State were accused of beheading two Free Syrian Army fighters and leaving their severed heads beside a garbage can in a square in Dana, a rebel-held town in Idlib Province near the Turkish border. The attack came after clashes broke out at a demonstration against the Islamic State, leaving 13 people dead. Recently, a fighter from the area, Abu al-Haytham, claimed that the rebel dispute began when a foreign fighter with the Islamic State raped a local boy—“the last straw,” he said—and Free Syrian Army commanders complained. The plans call for the C.I.A. to supply only small arms, and to only a limited segment of the opposition—the actual numbers are unclear. In addition, much of the training, which is to take place over months in Jordan and Turkey, has not yet started, partly because of Congressional objections. Many in the administration say they are still seeking to satisfy themselves that they have taken all precautions possible to prevent weapons from falling into the hands of Islamic extremists in Syria. To them, the plan carries echoes of previous American efforts to arm rebels in Angola, Nicaragua and elsewhere, many of which backfired. There is also fear at the White House that Mr. Obama will be dragged into another war in the Middle East. But others, particularly many in the State Department, argue that the United States must intervene to prevent a further deterioration of security in the region and to stop a humanitarian crisis that is spiraling out of control, officials said. Syrian rebels said Saturday they fear being sucked into a “side war” with jihadists as claims about an overnight attack on a weapons depot at their Idlib headquarters threatened to push the opposition deeper into a spiral of infighting. A reconstruction of the debate over arming the Syrian opposition shows how much administration lawyers played a cautionary role in the process, parrying calls for more assertive U.S. action by citing the risks of skirting international law, triggering a shooting war and setting legal precedents that could be cited by other countries, such as Russia and China. Obama, of course, long resisted pressure from the national security establishment to arm the rebels, but he caved in not long ago.